Challenge and engage your students with this wonderful resource! 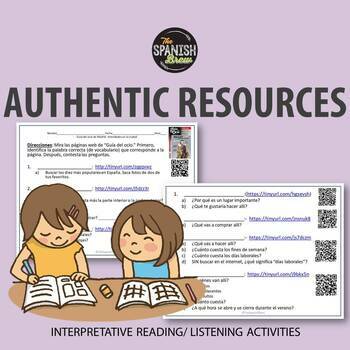 It includes questions to an authentic resource -several pages of the Guia del Ocio de España. The vocab correlates with Spanish 1 vocab such as: la piscina, el cine el parque, ect. 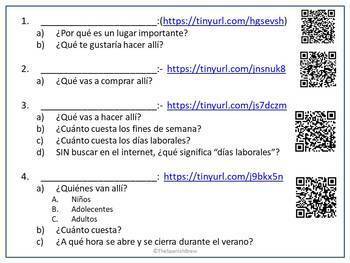 This activity is targeted at Spanish 1 students and will challenge them to extend their knowledge of "la comunidad" vocabulary to a higher level of analysis. It is a great way to get your students practicing the question words! 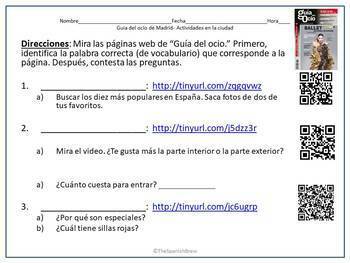 Handout includes links as well as a QR codes to all the pages. Teacher answer key included. The documents are in Spanish.